Located in the established neighborhood of Deepwell in the low wind South area of Palm Springs. This beautiful mid-century home has original stone fireplace, beamed ceilings, 3 bedrooms and 3 full baths. Our spacious 2800 square foot home is furnished with a throwback modern, mid-century style. A mix of vintage and new furnishings intent on creating a comfortable, peaceful home for your vacation getaway. Featuring a living room with a 46'' HD LCD tv , an entertaining area showcased by the original stone gas fireplace, & dining area complete with vintage built-in bar. Fully equipped kitchen has all stainless steel appliances and comes stocked with all the cooking amenities you need. The kitchen includes a breakfast area looking out onto the beautiful sun filled backyard and pool. Our backyard gives you resort like privacy, complete with your very own salt water pool and Jacuzzi. With a backdrop of breathtaking mountain views, our home is the perfect place to relax and take in the beauty of Palm Springs. **Security deposit is $750 during all festivals. Will be changed after reservation if booked instantly. We loved it. Perfect for our family. 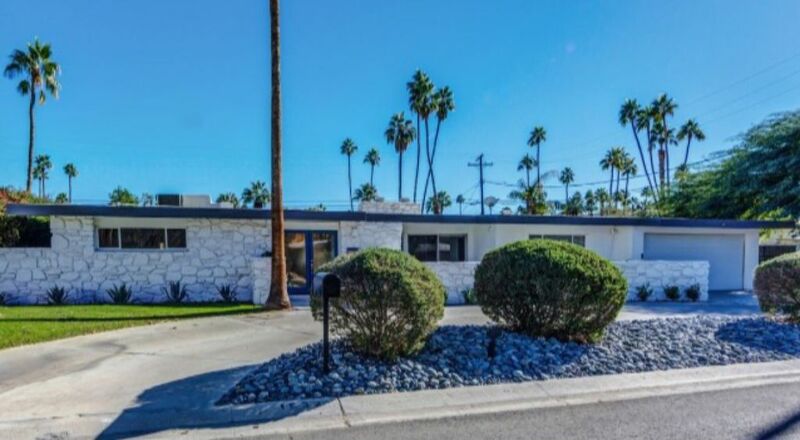 Beautiful Midcentury home in the perfect quiet Palm Springs neighborhood. The kids enjoyed the pool, and the adults loved the covered outdoor living and spceous home! And great location close to the grocery store and only a 5 min drive to downtown. Over the years I have stayed in many homes at Palm Springs but I have to say that this home was the best! Kelly was super helpful and quick to respond to any questions throughout our trip. I would recommend this home to anyone. There is a lot of room to lounge and the pool area is awesome! Loved it! We will definitely be back! Thank you very much for the hospitality. I cannot thank Kelly for welcoming us into her home. It was in a quiet neighborhood, accessible to everything in Palm Spring. The house was the perfect size for my family and friend’s getaway. The 6 of us enjoyed how warm and open the house felt. After staying her for 5 nights here, none of us wanted to leave. Nice home in a quiet neighborhood. Kelly was always available and so nice to deal with. Gem of a house and owner! Our family was travelling to Palm Springs to watch the Indian Wells tennis tournament. We had a lot of plans change and needless to say, had to book a place the night before. Kelly came to the rescue with her spacious, beautiful home! The house more than accommodated my in-laws, husband and I, our one-year-old daughter, and our dog. But the best part of the house had to be the pool and spa, where spent most of our time! The backyard is very private and the pool is beautiful. It was our daughter’s first time swimming and she loved it! There is plenty of outdoor seating to sit poolside, which we also enjoyed. On top of all of that Kelly is incredibly accommodating and welcoming, making sure the house was stocked even though we booked on such short notice. We made such fun memories with our daughter and family thanks to Kelly’s house! I would definitely recommend renting this house. Thank you so much for letting us stay in your home! 4 to 7 night stays required for Holidays/Events/Festivals regardless of season. Rates for these times may be higher than our standard season rates $200 cleaning fee - If you are a very small group, please inquire if a lower cleaning fee may be possible.. $500 security deposit or $300 deposit with purchase of a damage policy for $49,99. PETS WELCOMED - Dogs, cats, & more! Pet cleaning fee equal to pets staying and dseposit may be required. Tax applies to all stays 28 days or less QUESTIONS WELCOMED!